If you’re suffering from tooth loss, advancements in dentistry now allow you to benefit from multiple options. In the past, if you had missing teeth, dentures, partial dentures, and bridges and crowns were the only options. Now, you’re able to benefit from the traditional forms of tooth replacement, as well as new advanced treatments, such as dental implants. Long Family Dental is a dentist in Midlothian to help treat your tooth loss. We offer a diversity of options to meet your individual needs and budget to regain a complete smile. When you’re suffering from tooth loss, replacing your missing teeth will help you regain your confidence while protecting your overall health and quality of life. When you leave missing teeth untreated, your remaining teeth and structures no longer have adequate support or stimulation. As a result, bone density and the supporting structures begin to deteriorate. As deterioration progresses, your remaining natural teeth will shift, causing them to become misaligned. The misalignment opens the door to tooth decay, gum disease, and makes simple tasks like eating and speaking more challenging. Not to mention, the lack of support can eventually compromise your remaining teeth, even to the point of tooth loss. You need to give your teeth and structures the support they need with an appropriate tooth replacement option. Depending on your degree of tooth loss, there are many options available. Crown and Bridges—Crowns and bridges are one of the most affordable and widely used forms of tooth replacement. A bridge fills the gap from the missing teeth. Crowns placed on the adjacent teeth anchor the bridge in place, giving your teeth the support they need while improving your oral function and appearance. Partial Dentures—For those who are missing one or multiple teeth, partial dentures will give you a complete smile using a removable dental prosthetic. Using a method that’s similar to traditional full dentures, only the missing teeth are replaced using the prosthetic device. Using a metal frame work to hold the partial denture in place, you’ll have a complete smile for added confidence. Full Denture—Full dentures are used to replace all of the missing teeth on the top or bottom jaw using a removable device. New advancements make dentures appear more natural while increasing the comfort and function of the device. 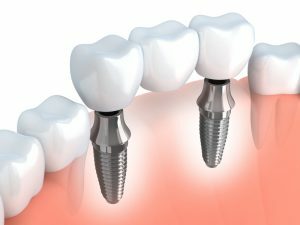 Single Tooth Implants—Implants are the most preferred option for tooth replacement because they provide a permanent solution. Using a titanium post that’s surgically inserted into the jaw bone, you regain the function of a tooth using a prosthetic. Implant Supported Dentures—For those who are missing all of their teeth on the top or bottom jaw, implant retained dentures hold a denture-like device in place using 4 titanium posts that are surgically inserted into the jaw bone. This provides the highest degree of function and stability when needing full tooth replacement. Long Family Dental provides many tooth replacement options, including dental implants in Midlothian. If you’re in need of a dentist in Midlothian for tooth replacement, call our office at (469) 336-3086 today.